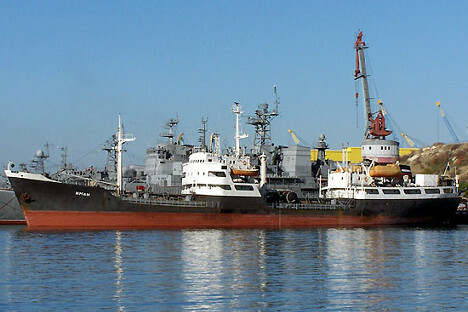 Currently Tartus is being used as a logistics facility for Russian ships. Russia plans to deploy a naval base in Syria’s Tartus on the permanent basis, Deputy Defense Minister Nikolai Pankov said on Oct. 10. "In Syria, we will have a permanent naval base in Tartus. The corresponding documents have been drafted. Currently they are in the process of inter-departmental coordination. The degree of readiness is rather high. We hope that we will soon ask you to ratify these documents," Pankov said at a meeting of the Federation Council’s international affairs committee. Currently Tartus is being used as a logistics facility for Russian ships. And A Russian aerospace group is stationed at Hmeymim, Latakia province. The State Duma on Oct. 7 ratified a Russian-Syrian agreement on the open-ended deployment of the Russian air group in Syria. The agreement was signed in Damascus on Aug. 26, 2015. Nearly a year later President Vladimir Putin submitted it to the State Duma for consideration. The Federation Council will consider the agreement on Oct. 12. Russian on Sept. 30, 2015 launched an anti-terrorist operation in Syria at the request of Syria’s President Bashar Assad. Russian planes are based at the Hmeymim airdrome. In March 2016, Putin issued orders to pull out the bulk of the Russian air group form Syria, but the remaining planes continued to deal strikes against militants.